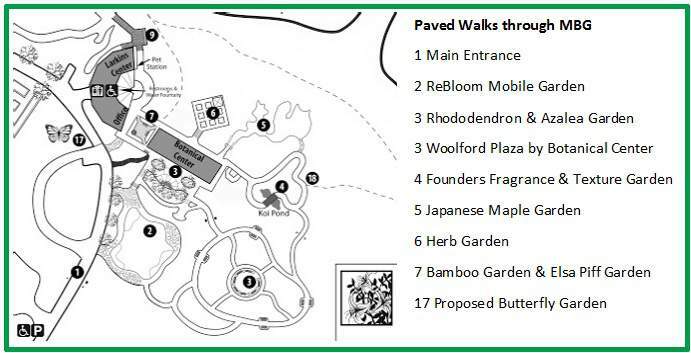 A suggested self-guided walk through areas suitable for those needing wheelchairs, or level ground for walking, starting at the Entrance Gate. The PDF map and description will open in a new tab. Printed maps are available at the MBG Office when you visit. This area demonstrates the concept of ReBloom Mobile, a Tricentennial Project started in 2002, with the aim of showcasing the vast range of plants that can be used in the Gulf Coast region to achieve color and garden interest all-year round. 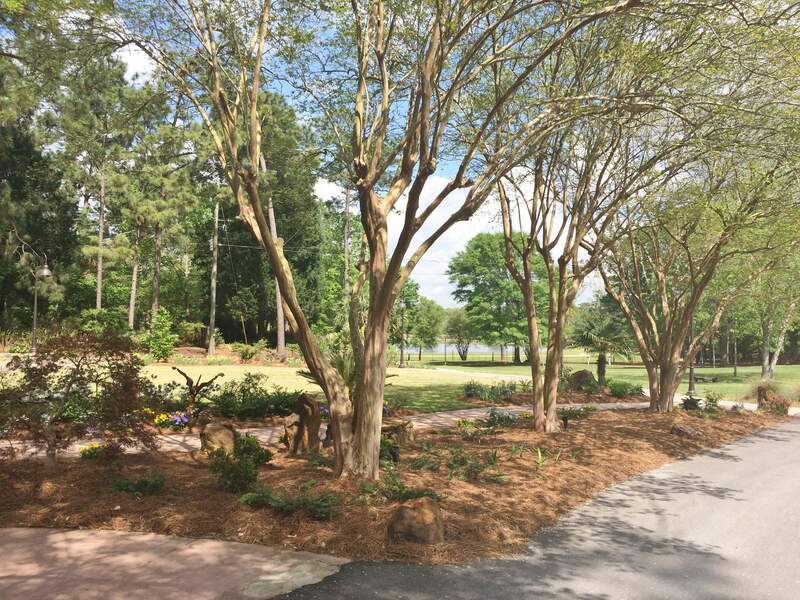 Featuring paths inlaid with local Alabama stone around a central lawn, this area shows many plant combinations that will work in the home landscape. There are stairs and ramps that lead up to the Woolford Plaza in front of the Botanical Center. Named in honor of Millie McConnell, one of the first members of the MBG, this garden was extensively redesigned in 2006. 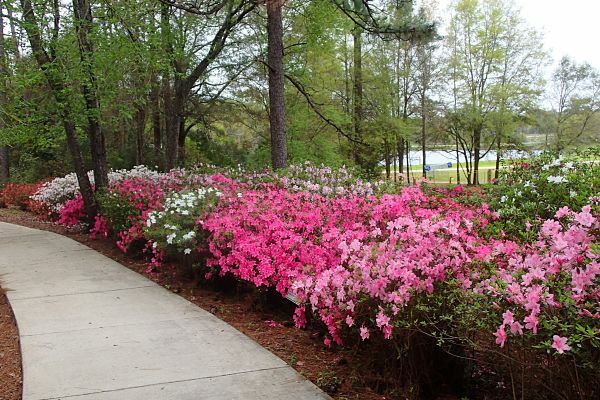 This is the most comprehensive rhododendron & azalea collection along the Gulf Coast. Against a background of longleaf pines and assorted trees the Azalea bloom season lasts from early March through June in a succession of color. With so many variations within the collections, this garden is an art gallery of plants with samples of the hybridizers work. The paths converge at a center Plaza flanked by 19th century cast-iron columns which once graced now demolished buildings in downtown Mobile. The hand-made brick pavers, donated by the City of Mobile Archives, once paved downtown streets. Botanical Note: Azaleas and rhododendrons are classified botanically in the same group, with many variations in size, bloom, leaf shape and color. Dedicated to the Founders of the MBG this was the first cultivated garden installed in the early 1970’s. It was designed especially for the enjoyment of the visually impaired. With it’s winding circular pathway, this shady garden has a vast array of interest. Plants are chosen for their perfume and feel, as well as their visual interest, so it can be enjoyed by all. Mature plantings of over 30 different trees and shrubs form a glorious background to perennial and seasonal plants. John Allen Smith, a dentist and owner of Magnolia Nursery in Chunchula was an avid plant collector. 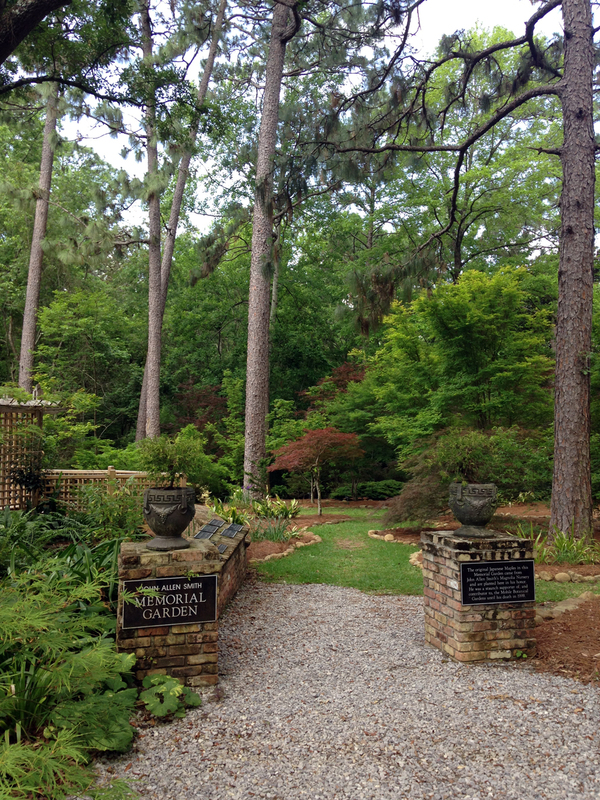 His collection of Japanese Maples is planted in his memory under longleaf pines in this tranquil area. With the different hues and textures, followed by good fall and winter color there is always good visual interest in this shaded corner. The entrance wall holds memorial tributes to loved ones. There are level grass pathways in this small garden. 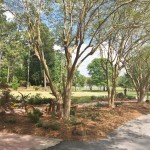 Sheltered by a canopy of longleaf pines, the brick raised beds are planted with herbs for many uses: culinary, medicinal, spiritual, fragrance and practical household use. The use of seasonal annuals, perennials and small shrubs show how herbs can be used in the garden landscape for year-round pleasure. A corner arbor, latticed seating, statuary, and a water feature make this a charming, intimate garden. It was established in 1996 and dedicated to long-time member of the Gardens and Herb Society, Sybil Burnett in 2010. 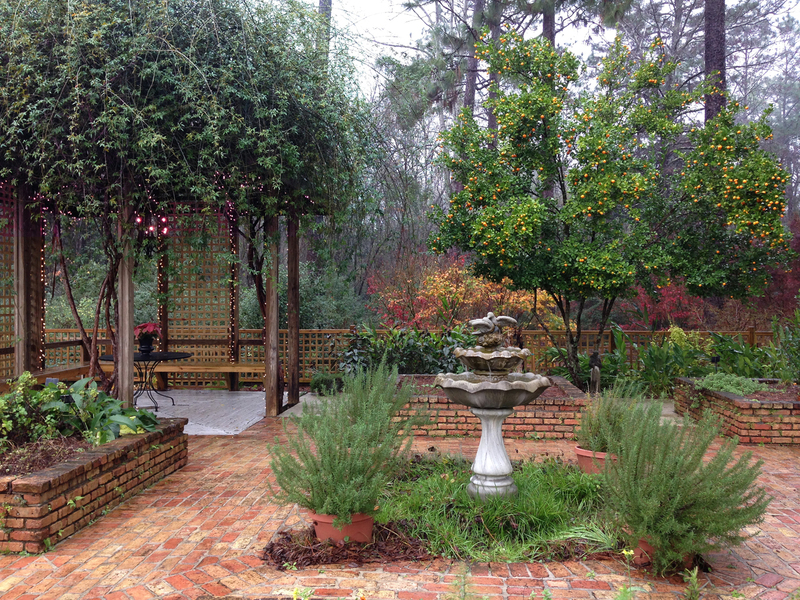 The Gulf Coast Herb Society, established in 1985, maintain this garden as part of their ongoing program of herb education. Created in the memory and in honor of Mrs Elsa Piff, this garden area features clumping bamboo as a background to shrubs, perennials and seasonal annuals that attract hummingbirds and butterflies. A seating area, along with a small fountain amongst the flowers, invites visitors to sit and admire the views. The MBG Office is located in the building to the east of this area. This planned garden is currently under construction as fund-raising continues. The centerpiece is “Transformation” by local sculptor, Bruce Larsen. The plan calls for meandering walkways with benches, amidst a large selection of butterfly—attracting nectar and larval food plants.